February's first batch of payout hikers included one of the most durable industrial companies on the market, a media giant, and a well-known name in vitamins and supplements. In January, despite the dizzying, up-and-down lurch of the stock exchanges, over 100 companies pushed their distributions higher. 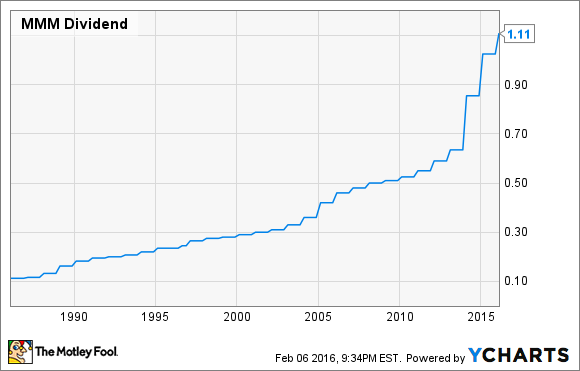 Will February be another banner month for dividend raises? If its first week is any indication, February should give January a run for its money. There were plenty of headlines regarding dividend hikes over those five days; here are three worth a look from income investors. 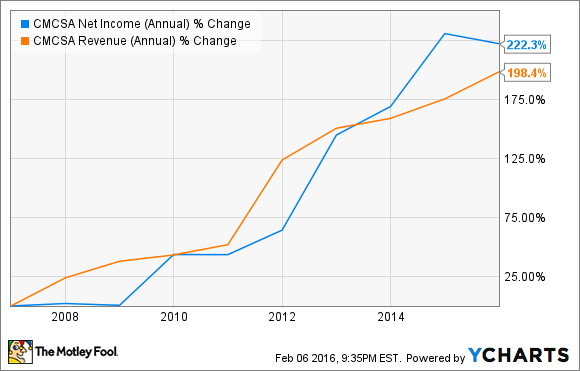 One of the most consistent dividend raisers on the market, 3M (NYSE:MMM), is doing it again. The sprawling industrial conglomerate has declared a quarterly payout of $1.11 per share, an 8% increase over its predecessor. That was very much to be expected as 3M is a dividend aristocrat, i.e. one of the few stocks that has raised its distribution at least once annually for a minimum of 25 years running. It's been able to do so because it has been a consistently profitable enterprise generating a mountain of cash. Recently, investors have been concerned more with growth; even though revenue and net profit beat expectations in the latest quarter, both metrics were down on a year-over-year basis. This was due in no small part to a sales drop in 3M's core industrials product category, while a steeper decline in the electronics and energy division didn't help matters. But on a long-term basis, 3M has proven to be an excellent performer, and one that still has plenty of free cash it can return to shareholders. The dividend remains well within the company's financial means, and remain so for the foreseeable future. I'd put money on the company returning to form and growing again. And I wouldn't worry at all about it being able to keep that dividend raise streak alive. 3M's new payout is to be dispensed on March 12 to stockholders of record as of Feb. 12.
Who says cable TV is going obsolete? Certainly not Comcast (NASDAQ:CMCSA), which boosted its quarterly distribution following a solid fiscal year (and Q4) full of growth. The company will pay just under $0.28 per share, 10% higher than its predecessor. Good results aside, that's typical for the company, which has raised its payout annually since relaunching it (following a nearly decade-long hiatus) in 2008. Since then, the payout has risen from just over $0.06 per share to the present level. In Q4, the company managed to keep the dreaded cord-cutting beast at bay, recording net additions of around 53,000 video customers. Out of that number, its customer loss figure (36,000) was its lowest in years. Meanwhile, the number of broadband customer additions grew by 23% on a year-over-year basis, to around 460,000. And the quarterly and annual revenue and net profit figures rose, with both line items beating the average analyst estimates. It says something that Comcast is holding its own in the face of the ever-growing threat of cord-cutting, not to mention an increasingly big lineup of alternative programming providers (Hulu, Sling, etc.). Meanwhile, this latest dividend raise, even at that 10% rate, will easily be covered by the company's free cash flow, as it's several times higher than its total payout. 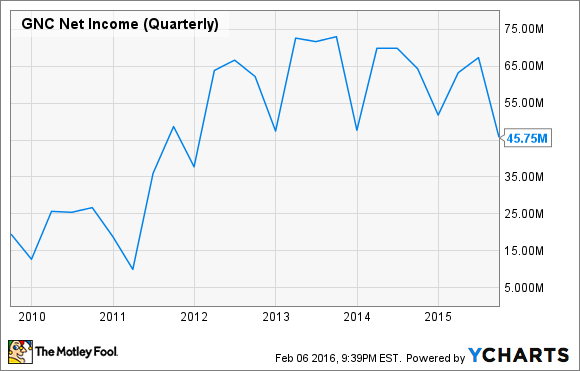 Comcast's new dividend will be handed out on April 27 to shareholders of record as of April 6. Vitamin and supplements retailer GNC Holdings (NYSE:GNC) is bulking up its quarterly dividend to $0.20 per share. That's an 11% increase over the previous payout. The raise comes shortly after the company released preliminary Q4 results that were encouraging, if not spectacular. They indicated that same-store sales ticked up on a year-over-year basis, and that fiscal 2015 per-share earnings will come in at the upper range of the company's guidance ($2.87 to $2.92, up from 2014's $2.81). The company is surely glad that 2015 is over. Last year GNC Holdings not only missed on earnings estimates more than once, it was also targeted with several investigations and lawsuits over certain herbal supplements it sold. It has since suspended sales of the offending supplements, while beefing up margins for its products -- hence the demonstrated growth. Yet the company operates in a crowded market, with a great many outlets, from mom-and-pop street corner operations to big pharmacy chains, offering the same kinds of goods it sells. That said, the dividend is well sustainable, and GNC Holdings seems poised for growth. The company doesn't exactly have a wide moat, but it does seem to know how to make money. It also seems determined to keep returning some to its investors. GNC Holdings' new dividend will be paid "on or about" March 25 to stockholders of record as of March 11.